Les habíamos prometido hacer una recopilación de cuál había sido la repercusión que la presentación del proyecto Hiriko. La verdad es que ha sido extraordinaria. Así que les dejamos las referencias más importantes que hemos encontrado. An electric car prototype that folds into itself to save parking space, and is powered by four in-wheel motors, will be launched tomorrow (Tuesday, January 24) by José Manuel Barroso, president of the European Commission, in Brussels. E’ piccola, biposto con il motore elettrico e soprattutto pieghevole. Si chiama Hiriko, è la vettura del futuro, presentata oggi da un’azienda dei Paesi baschi al presidente della Commissione europea, José Manuel Barroso, a Bruxelles. “Hiriko non è un nome giapponese, ma basco: significa ‘urbano’ in lingua basca”, ha sottolineato Gorka Espiau, rappresentante del consorzio di sette aziende basche che ha realizzato la vettura, durante la presentazione nella capitale belga. Su volante es similar al de un Fórmula 1, tiene un motor en cada rueda y se pliega al aparcarse: Hiriko, el minicoche eléctrico español presenta en Bruselas su revolucionario concepto de movilidad urbana que pronto saldrá a las calles de cinco ciudades europeas. 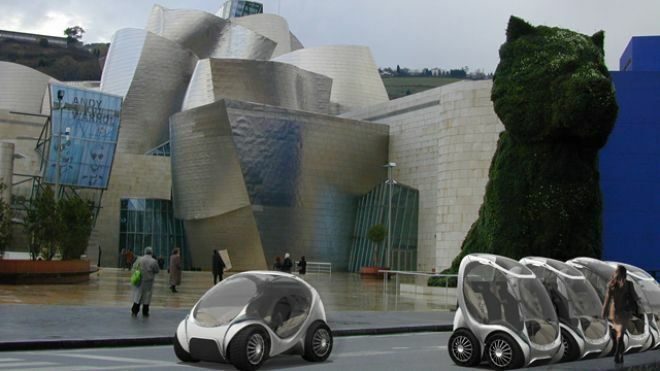 A tiny revolutionary fold-up car designed in Spain’s Basque country as the answer to urban stress and pollution was unveiled Tuesday before hitting European cities in 2013. The “Hiriko”, the Basque word for “urban”, is an electric two-seater with no doors whose motor is located in the wheels and which folds up like a child’s collapsible buggy, or stroller, for easy parking. In Brüssel ist am Dienstag das Elektroauto Hiriko Citycar präsentiert worden. Der Wagen sieht aus wie ein Regentropfen auf vier Rädern und ist genauso geschmeidig: Auf Knopfdruck faltet sich der Zweisitzer auf ganze 1,50 Meter zusammen. Der Fahrer kann die Frontscheibe hochklappen und nach vorne aussteigen – wie bei der legendären Isetta. Vier Elektromotoren treiben das Auto an, maximal bringt es 90 Stundenkilometer auf den Asphalt. At European Union Commission headquarters in Brussels on Tuesday, the commission chief, José Manuel Barroso, inspected a small city-car prototype. 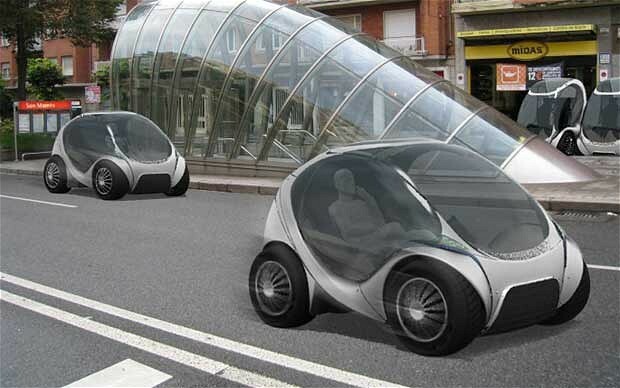 It was the commercial version of the long-gestating CityCar from the Massachusetts Institute of Technology Media Lab. Mr. Barroso posed for pictures inside the vehicle, which has been renamed the Hiriko, the Basque word for urban. The trial production of 20 cars and a pilot program are scheduled to begin next year in Spain’s Basque region, at Vitoria Gasteiz, not far from Bilbao. Hiriko, une auto électrique pliable ! Le projet de cette citadine électrique a vu le jour à Boston, dans le MIT-Media lab, sur une idée des quelques étudiants et de professeurs de l’institut. Mais le développement de Hiriko a été entièrement réalisé en Europe, plus précisément au Pays Basque espagnol, avec la participation de sept entreprises dont Denokin et Epsilon Euskadi. Lors de la présentation, José Manuel Barroso indique que le concept atteint une vitesse en pointe de 60 km/h et dispose d’une autonomie de 120 km. Les moteurs, intégrés aux roues, permettent également une rotation complète à 360 °. La particularité de cette voiture est toutefois sa capacité à se plier, lui permettant de se garer sur un espace réduit. Non solo è un’auto elettrica ma è anche pieghevole: l’ideale in fatto di maneggevolezza e di basso (o nullo) inquinamento astmosferico. Diverse città europee si sono affrettate ad adottare Hiriko, una piccola citycar a 2 posti presentata addirittura all’interno del palazzo della Commissione europea a Bruxelles, per mano del presidente Manuel Barroso, che è stato il primo a testare lo spazio di questa piccola vettura destinata principalmente al traffico urbano del futuro. Der Zweisitzer Hiriko ist ein außergewöhnliches E-Auto-Konzept, das in einer Kooperation des Massachussets Institute of Technology mit der spanischen Regierung und baskischen Unternehmen entstanden ist. EU-Kommissionspräsident José Manuel Barroso nahm bei der Weltpremiere in Brüssel in dem runden Zweisitzer Platz. “Dies ist ein erfolgreiches Beispiel dafür, wie den gesellschaftlichen Herausforderungen wie Stadtmobilität und Luftverschmutzung zu begegnen ist”, sagte Barroso. 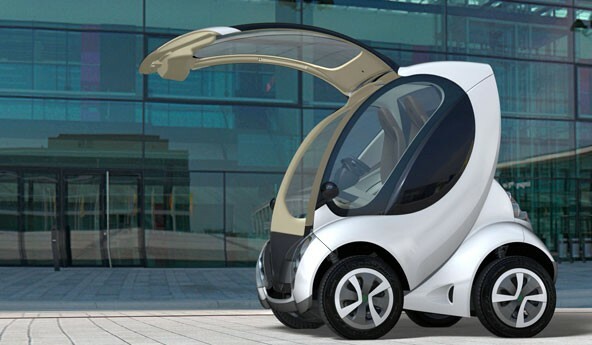 Meet Hiriko, a new electric car that can fold to one-third the size of a Smart car. But its Spanish and American designers may face an uphill battle selling it to the European public. A transatlantic team of designers and builders have created a new kind of electric car that not only saves gas but saves space. The Hiriko automobile, which was conceived at the Massachusetts Institute of Technology in the United States, but built in Spain’s Basque country, was finally unveiled at European Union headquarters in Brussels this week. Um consórcio formado pelo conhecido o MIT e sete empresas sediadas no País Basco (região no norte da Espanha) anunciou na última quarta-feira a chegada do Hiriko, um veículo urbano que era apenas um protótipo até julho do ano passado. Ele tem como grande diferencial a capacidade de se “dobrar” para economizar espaço quando está estacionado e assim facilitar a vida dos motoristas de um futuro nem tão distante assim. UNLIKE their American counterparts, European carmakers have long been associated with small, compact runarounds like the Fiat 500, Citroen 2CV, Mini Cooper, or more recently the Smart car. That has always made sense. Many roads are narrower and parking spaces pokier in Europe than they are across the Atlantic. And most people rarely drive the vast distances where a bigger car’s greater comfort is worth paying for (though, in fairness, nor do most Americans—at least not any more). Now, a consortium of seven firms from Spain’s Basque country and the Massachusetts Institute of Technology (MIT) Media Lab have taken this to extremes. Parking is about to get a lot easier, as long as you don’t mind driving a car that folds in the middle. Developed over the past four years by MIT, the Hiriko is an electric microcar that has the unique ability to make itself shorter than it already is. The size of a Smart Fortwo when fully extended, the two-seat vehicle can shrink to about half its length and features a front-opening canopy to facilitate head-on curb parking. Three of them will fit side by side in a standard space. Una veintena de empresas han manifestado su interés en la franquicia del coche eléctrico Hiriko, según destacó en Bruselas el presidente del consorcio del País Vasco fabricante del mismo, Jesús Echave, quien expresó su satisfacción por el respaldo de la Comisión Europea CE al proyecto. The modern automobile sets us free and ties us down all at once. It takes us wherever we want to go — but it gets caught in traffic, is a pain to park if you live in a city, and pollutes the air. Some folks just don’t get parking. Slipping into a tight spot induces all manner of angst and trepidation. And parallel parking? In traffic? Are you kidding? Forget it. That takes a certain amount of four-wheel juju that some folks were just not born with. La tecnología verde viene tomando cada vez mayor protagonismo y Hiriko podría convertirse en el primer eléctrico español en ver la luz. Una veintena de empresas ha manifestado su interés en la franquicia de este coche eléctrico, según destacó esta semana en Bruselas el presidente del consorcio del País Vasco (España) fabricante del mismo, Jesús Echave, quien expresó su satisfacción por el respaldo de la Comisión Europea (CE) al proyecto. Everything is smaller when folded, but could that work for cars as well? A consortium of technology companies in the Basque region of Spain is planning to produce a tiny city car that was developed at the Massachusetts Institute of Technology. Called Hiriko, European Commission President José Manuel Durao Barroso said the car “is an answer to the crisis,” the crisis being the problem with parking in Europe’s densely packed urban centers.